I am a big lover of Reuben sandwiches . . . the toasted rye bread . 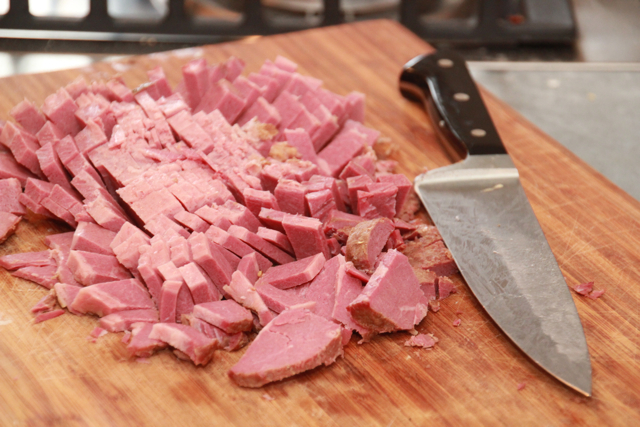 . . the corned beef . . . Swiss cheese . . . sauerkraut . . . it just doesn’t get much better! Except it just did get better! For our last Cooking Class at The Lark Inn, we again invited guest Chef Gary Martin to join us . . . and join us he did! 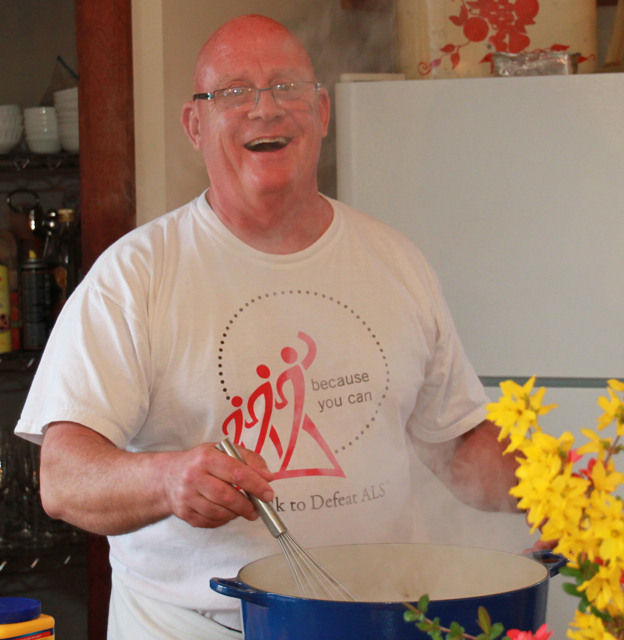 In addition to his lovely wife Linda, Gary brought his fabulous recipe for Cream of Reuben Soup! Everyone had a great time watching Gary with his preparations and of course the best part . . . enjoying his creation!! This is truly like a Reuben sandwich in soup form. It is so full of flavor and it is not nearly as rich as I had first imagined. It is the perfect blending of flavors, and texture . . . you are going to love it! Let’s make Chef Gary’s Reuben Soup! 1. 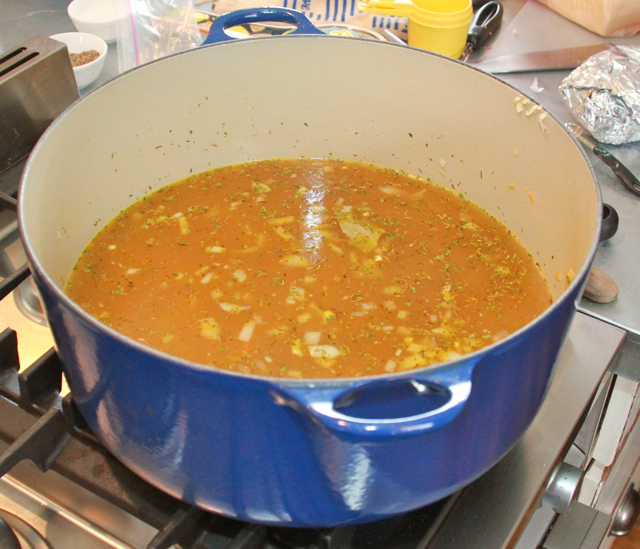 In a large Dutch oven, sauté onion and carrot until soft. Add garlic, white pepper, tarragon, thyme, bay leaf and chicken broth, bring to boil. Reduce heat and simmer for 30 minutes. 2. Stir together cornstarch and water and stir into soup. Return to boiling and simmer until thickened. 3. Add whipping cream and continue simmering about 20 minutes. 4. Reduce Heat. Stir in cheese until melted. Add corned beef. 5. 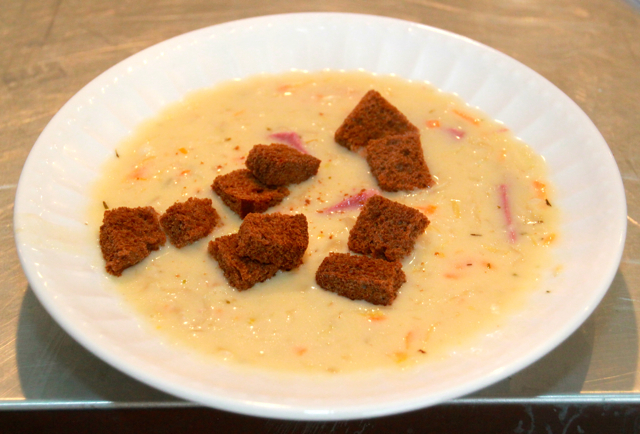 Serve in bowls topped with croutons. have as much fun cooking as Chef Gary Does!! Now . . . ENJOY!! For information about previous and future Cooking Classes at The Lark Inn please visit our website at: TheLarkInn.com. Also, ask about our new Cooking get-a-way package at The Lark In Guesthouses. What could be more fun than getting away to the fabulous Flint Hills and . . . having a cooking class of your own design. You custom select the menu from our many previous ones on our website or mix and match . . . we do the rest! CLICK HERE to let us know what kind of a cooking class you would like!